This time, though, is a bit different. When Cuaron won the first time, it was for space epic Gravity, a mega-studio production with a budget of $100 million and mega-stars Sandra Bullock and George Clooney. In sharp contrast, Roma was an intimate black-and-white movie about a family in turmoil in 1970s Mexico City, and the class dynamics that reigned. It also was filmed in Spanish and the indigenous Mixtec dialect. It was the first film Cuaron made in his homeland since he burst onto the scene with his coming-of-age flick Y Tu Mama Tambien. The cast and crew of the Netflix production were nearly all Mexicans. 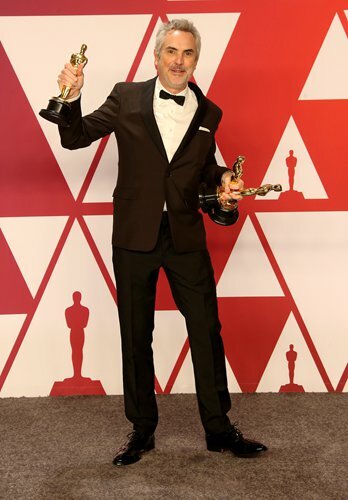 Cuaron's success is "good for all of Mexican cinema," the president of the Mexican Academy of Film Arts and Sciences, Ernesto Contreras, told AFP. "We owe the success of Roma to Alfonso Cuaron, but also to his team, from the actresses to production designer to sound technicians." For years, the Oscars have become a bit of a love fest for the so-called "three amigos" of Mexican filmmakers, who have won the best director trophy for five of the past six years. It started with Gravity, which won seven Oscars in 2014, including best cinematography for Mexico's Emmanuel Lubezki. The following year, Alejandro Gonzalez Inarritu triumphed with Birdman, which won four Oscars including best picture and best director. And in 2016, Inarritu scored again with The Revenant - the director and Lubezki again took home statuettes, as did lead actor Leonardo DiCaprio. He again won a special achievement Oscar for his interactive Carne y Arena (2017). In 2018, it was Guillermo del Toro's turn - his fantasy romance The Shape of Water earned four Oscars including best picture and best director. For film critic and researcher Rafael Avina, Roma made Hollywood realize that "in Mexico, we are doing interesting things." Amat Escalante, Carlos Reygadas and Michel Franco have made waves at the top film festivals in the world - Cannes, Berlin and Venice. "Mexicans conquering Hollywood and Europe - that is going to continue, that train has left the station," Avina said. In Roma, Cuaron was able to explore racism in Mexican society through his main character, Cleo, patterned on his own nanny and played by a first-time actress of indigenous descent, Yalitza Aparicio. "I want to thank the Academy for recognizing a film centered around an indigenous woman... a character that historically has been relegated in the background in cinema," Cuaron told the Oscars audience. "As artists, our jobs are to look where others don't. This responsibility becomes much more important in times when we are being encouraged to look away." For Mexico's film critics, the worldwide success of Roma also presents a major challenge for the country's movie industry - raising awareness among local filmgoers about the quality of homegrown, auteur films. "If this inspires our audiences to have confidence in films made by Mexican filmmakers and if the state supports their efforts, we will have taken a major step forward," explained critic Carlos Bonfil.